How did you decide on musical genres and songs? At first there weren't many songs, only 10. And they were all classical. Why all classical? Is that what Miyamoto-san wanted? Did you? (laughs) But the songs in Wii Music are special. The amount of data for each song must be incredible. I thought so. The software has to be ready to respond so that no matter how someone plays, the song still sounds all right. The music scores alone have to be fairly substantial, and you can’t leave it all up to a computer, right? As someone who understands music, you have to consider people who don’t understand it very well and prepare responses to every possible player action. If they do this, then the game does this. If they do that, then the game does that. Otherwise the songs would fall apart. Why were they all classical? We wanted people all over the world to enjoy playing so we decided on music known all over the world. There were only 10 songs, but you could play around with different arrangements. We thought 10 songs would be plenty to serve as material for that. I see. How did the game change into its present form? Well, we consulted Miyamoto-san, and he said there weren’t enough songs. He suggested 100. From 10 to 100?! (laughs) I bet you were floored. So, what happened? So we mulled it over. Wada-san, what did you think about that number? Well, every task was going to be multiplied by 50 so I knew it was going to be rough. I tried to be happy that 100 had become 50, though. The timing wasn’t bad, though. When we settled on 50 songs, the sound team rallied behind us. You mean you borrowed a lot of members from the sound team? Right. I put in a plea to Koji Kondo. I put it rather strongly, saying, in effect, ‘Come on! It’s a sound game, for Pete’s sake!’ (laughs) So we ended up with an amazing team. Yeah, it really was amazing. I heard about that. Our battle-hardened, powerhouse sound team pulled behind you. I’ll read you some of the names. 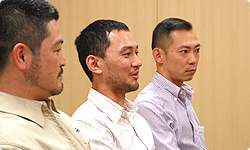 First of all, Koji Kondo, whom I’ve mentioned a couple times, came on board to lend general support. 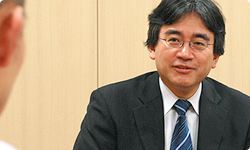 There may be no need to explain, but I’ll add that he’s Nintendo’s foremost music composer. He’s worked on series such as Mario, Zelda and Star Fox.As you read each name, could you mention what they’ve worked on? Sure. 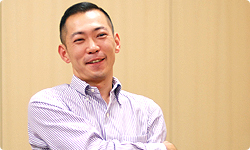 He isn’t here today, but our sub-director, on board from the very start, was Mitsuhiro Hikino, who had worked on games like Mario Kart DS, Pikmin 2 and Super Mario Sunshine. Our sound director, Hajime Wakai, had worked on the Nintendogs, Pikmin and Star Fox series.And here are the sound staff: Kenta Nagata, who had worked on The Legend of Zelda: Phantom Hourglass, The Legend of Zelda: The Wind Waker and the Animal Crossing series; Toru Minegishi’s background includes Wii Fit, the Animal Crossing series and The Legend of Zelda: Twilight Princess; Mahito Yokota had worked on Super Mario Galaxy and Donkey Kong Jungle Beat; Junya Osada had worked on Animal Crossing: Wild World; and last but not least was Takahiro Watanabe, who brought his experience working on The Legend of Zelda: Twilight Princess, The Legend of Zelda: The Wind Waker and Pikmin 2. Wow! I hate to rave about our own staff, but what an awesome line-up! Uh-huh. We really had some first-rate individuals helping out. But without so much experience behind us, we may not have been able to make this game. Like you said earlier, the songs themselves were only half of it. Right, you had to do a lot more than simply input music scores. Right. There are limitations built in to each function, and we had to allow players to play the music with a twist in such a way that it would turn out all right whatever they did. Could you briefly explain how you did that? In order to allow players to twist the music and make it their own, first we had to put into place a default arrangement to serve as an underlying framework. If we overdid this, the player’s hands would be tied, and he wouldn’t be able to play freely. So I told the team to provide the best mix of ingredients. In other words, don’t cook it because that’s the player’s job. Exactly. I asked them to assemble the best ingredients in such a way that no matter how you cooked them, the final dish would be all right. It would have been difficult to make a different team understand that. They let me make unreasonable demands like that. So…50 songs - with a full variety of genres. Did Miyamoto-san give you any suggestions regarding the genres? Yes. (laughs) He said we had to include blues. We added it at the end. Of course. (laughs) Did Miyamoto-san say anything else that shook things up? choking whereby you dampen the strings. Oh, I see. I’m glad the game allows such techniques. We didn’t have those until E3. The one not too long ago. Last year’s E3, you mean? No, the one not too long ago. You mean the one that just finished?! Yeah, we didn’t have glissandos or choking until then. Until then we were focused on creating a game that anyone could play well simply by swinging the remote. violin . We were trimming away extra operations that would cause the game to depart from these core methods. I thought, ‘OK, so maybe there are these techniques like glissandos and choking that you want to do when you play an instrument, but we’ve got to draw the line somewhere.’ Still, we were adding extra techniques up to the very end. How did Miyamoto-san tell you that was what he wanted? One day Totaka-san received a summons. A summons? 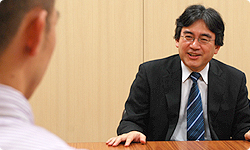 (laughs) You mean Miyamoto-san wanted to talk to him about something? That seems to happen a lot. (laughs) Since Miyamoto-san plays guitar, I suppose he wouldn’t let you get by without adding choking. You guessed it. He said electric guitar isn’t really electric guitar if you can’t choke it, and folk guitar isn’t any fun if you’re just pluck, pluck, plucking away. He said really laying on the chords is part of the exhilaration of folk guitar, and he was absolutely right. You had to think about it one more time. Exactly. One attractive aspect of the game was bringing out the particular characteristics of each instrument, but easy operability common to all the instruments was also important. Miyamoto-san was afraid we were going to lose what was most attractive. We continued to polish up game operation and most of the programming had been taken care of, but even though the game was easy to play, something had been lost of each instrument’s particular characteristics. We kept worrying that operability would become too cumbersome, and that we’d have to add instructions within the game about all the special techniques. 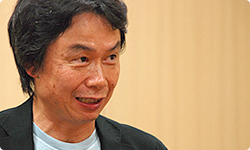 But Miyamoto-san said that even if we didn’t explain everything, players would have a good time discovering differences in sound that arose when they tried something new, like hitting a button. That can happen when you play a real musical instrument, too. I see. So those functions were a sudden addition after E3. I do think it improves the game’s appeal. Excuse me, may I say something? You guys have completely missed the point of all my wisdom! Ah! Miyamoto-san, you’re not supposed to be here. Well, it’s a good thing I am. It’s nice that the game gained appeal, but without those extra features, the instruments wouldn’t sound like themselves! For example, if you compare single notes from the guitar and ukulele sound sources, you can hardly tell the difference between them. If you ask the sampling staff, they’ll tell you the source sounds are different, but your average person out there can’t tell just by listening to single notes.A ukulele’s a ukulele because it’s four strings on a small body and neck that you strum all at once with your fingers, and a folk guitar’s a folk guitar because you can strum away at it. That’s what makes them feel real. I’m certain that’s what I told you, but you don’t seem to remember at all! Miyamoto-san’s not supposed to be here. Can anybody else hear Miyamoto-san? I could swear I just heard him talking. I can hear him, too! It’s just like he’s in the room with us!